A brake booster can be found in most of the modern vehicles. As you press down your brake pedal, you do not have to apply too much pressure to slow down the vehicle. This is because of the brake booster which amplifies the pressure you apply and helps in stopping the vehicle conveniently. Brake boosters are also called ‘servos,’ and they not only increase the safety of the car but help in improving the performance as well. 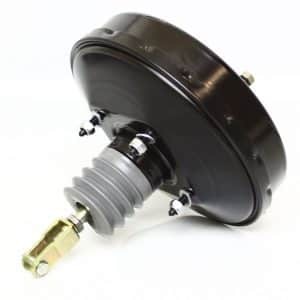 Like any other component in the car, the brake booster can get damaged after some time which may create hindrance while stopping the vehicle. In this article, we will discuss the common symptoms you will notice if you have a bad brake booster and how you can get it replaced. In the old days, vehicles were equipped with drum brakes which made use of their own power assistance. After that, they were replaced with disc brakes, but drivers still faced some trouble applying too much pressure for stopping the car. Thus, the modern vehicles came equipped with a brake booster. The main task of the brake booster is to reduce the effort of the driver when applying brakes. The brake booster which is positioned between the brake pedal and the master cylinder uses a vacuum to overcome fluid pressure in the brake assembly. Following are the key symptoms you should notice in case your brake booster is about to fail or has failed. The most common and initial symptom you will notice is that the brake pedal becomes hard to push. Moreover, at times the brake pedal may not even return to its original location and might stay glued to the floor. If you notice such a thing, it means that there is something wrong with the brake booster. Since it is not safe to drive with failed brakes, we recommend that you get the brake booster replaced as soon as possible. Besides the brake pedal is stiffer than average, if you notice that it is a bit higher than usual, it means that there is some problem with the brake booster. A situation like this can be dangerous and should be fixed immediately to avoid an accident. With a faulty brake booster, the pedal does not receive enough power to stop the car immediately. Thus when your brake booster starts malfunctioning, it will take longer for the car to stop. In slippery weather condition, this can turn out to be hazardous which is why we recommend that you take your car to a professional mechanic and have the brake system checked. A failing or faulty brake booster extracts additional vacuum from the engine. This happens when the diaphragm located in the brake booster malfunctions and allows the air to pass through the seal. As a result, each time you press the brake pedal, the engine will stall a little. This problem can even damage your engine and lead to more expensive repair. A failed brake booster sometimes produces a hissing sound which can be heard from under the dash. The noise is generated due to the vacuum escaping and this loss of vacuum may cause performance issues as well. To prevent any further damage to the brakes or the engine, it is suggested that you fix the brake booster quickly. How to Test the Brake Booster? Before heading to a mechanic for brake booster replacement, it is a good idea to check it yourself using the following procedure. Start by sitting in the car and setting the gear to neutral position in case of a manual car or to park position if you drive an automatic car. With the handbrake engaged, power the engine and let it sit idle for a while then turn it off. 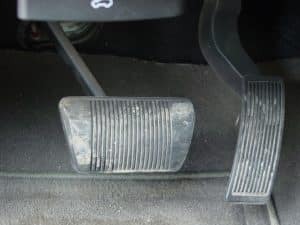 Start pumping the brake pedal generally for about four times and keep the pedal down by applying slight pressure on it. With your foot on the pedal, start the pedal, and you will notice that the brake pedal moves slightly downwards. If it doesn’t, then probably the brake booster lacks adequate vacuum. Lift your foot gently from the brake and switch off the ignition. Again put your foot on the brake pedal usually four about four times. If you can feel that the pedal rises after the second or third time after pressing, it is possible that the booster is retaining a vacuum. Or else, there might be a vacuum leak in the booster. You can use a vacuum gauge or a vacuum pump to know precisely where the problem is being caused. Power the engine then push down the brake pedal and turn the key to switch off the engine. Keep the pedal depressed for 30 seconds after turning off the engine and notice if it stays in that position after letting go. If it does not hold its place, there might be a leak either in the booster, vacuum hose or engine vacuum. The average cost of replacing the car brake booster is between $300 and $750. The spare parts itself cost around $160 and $550, while the labor cost is between $140 and $170. Depending on the mechanic, extra charges will be applied as well. However, the cost of replacement usually depends on the model and make of your vehicle. New vehicles with an advanced braking system are challenging to diagnose, and the replacement cost may be higher for such vehicles. It is recommended that you do a market survey and look for some mechanics before choosing the right one. Leave a comment down below if you have any other questions about brake boosters!